I would be remiss if I did not acknowledge that I’ve been so quiet over here in my little corner of the web for the past few weeks. Thanks for being patient and understanding and allowing me to be quiet. Life has gotten really busy and confusing for me, and I’m still trying to work it all out. Rest assured, all is well with all members of the AFM5 family! But the reality is that in life, you are often influenced and surrounded and pulled and pushed by more than just those whom you care about most, and by more than just those who care about you! The hard part for me, is finding a balance between compliments and criticism, between working for more and being satisfied with what you have, and between being content with who you are and wanting to improve yourself. Life is hard! But it is a good hard when I am surrounded and supported by my pups and my family and my friends (virtual and literal!) and my amazing husband. I know this is all a bit ambiguous and open-ended, and in some ways that is a deliberate, purposeful choice. Maybe by being vague, you will be more able to apply my struggles to your own life? Nevertheless, one thing I have learned, is that I am not myself without this special space. When I write, as much as the words jumble in my head, the rest of the environment gets kind of quiet. There is no pressure to communicate quickly, no set amount of time in which I have to express myself clearly, and no guidelines that limit my authenticity. I am able to slowly and conscientiously select the unique combination of words that puts genuine color and movement and music and texture to the thoughts and feelings and experiences that jumble inside my head and heart. And if I’m really lucky, it may spark something inside of someone else. So while the frequency of my posts may diminish for a little while, I’m making a conscious decision to share as I work through this challenge and change. It’s a daily struggle and a daily choice. The format and content of this space may change somewhat, but it will still be here. Stick with me, and I promise that I will be back to your regularly scheduled programming. Quality over quantity, and all of that. It’s so easy to continually push until tomorrow, but I don’t want to look back and see what I’ve missed. I want to enjoy the now… snowflakes and sunshine both included. With all of that being said, I want some input from my friends and readers. How do you bring balance to your life? Are you able to juggle it all, and if so, please share your secret! If not, how do you decide which balls to drop, and at what point do you remind yourself to restructure and prioritize? Thanks in advance for sharing your wisdom and honesty. How is it that my dogs never seem to have an issue with balance in their lives? If only they could share their secrets! It has come to my attention that there are some pups missing from our area (Freeport, PA to be specific. About 1/2 hour North of Pittsburgh). I don’t know the dogs or their owner personally, but we have many mutual friends who have implored me to help. Apparently the owner just moved to the area from South Carolina, so there is some talk or concern that they may be disoriented and trying to head ‘home’. They are said to be incredibly sweet, and while both have collars, they are unfortunately not labeled with contact information. 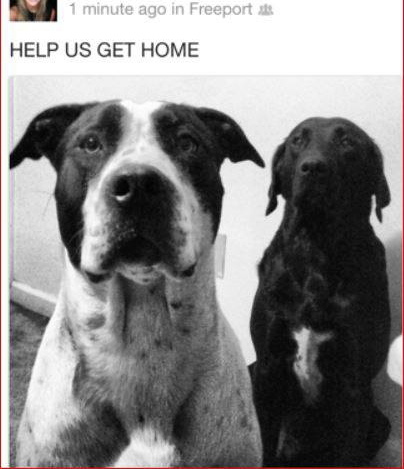 They have been missing for over a week, and it goes without saying that the owners are beside themselves. Please, please share this. This could so easily be your dogs, or your friends’, or your family members’, etc. Let’s help to get Buck and Reggie home safely. We live near many major highways, and so we don’t know who may have spotted them or picked them up with good intentions. Even if you aren’t in the area, please consider sharing this post and/or their photos. If your dogs were missing, how grateful would you be to others who got involved in helping them get back to you? Not to mention, there are enough unwanted and homeless animals in all of our communities… the least we can do is help return these guys to their loving owner and keep them off the streets and out of the shelters! And live to tell the tail tale! 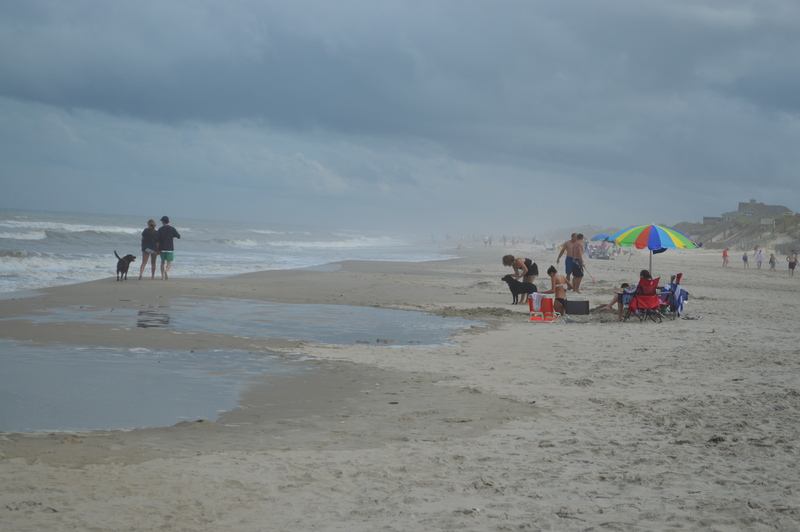 Thank you to our readers for being so patient last week while we were vacationing with family in the Outer Banks! I had hoped to sneak in a few posts throughout our time away, but a lack of consistent internet access made that goal almost impossible. Nevertheless, the blog and our readers were never far from my mind! 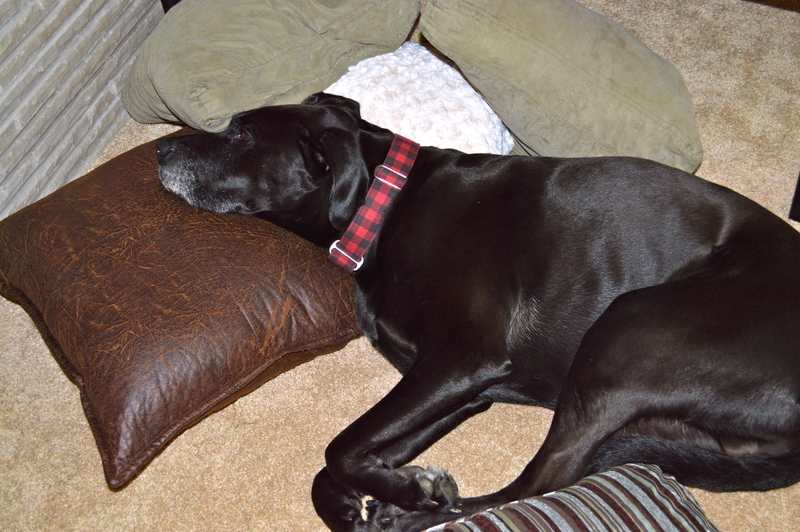 We so enjoyed our time away, but more than that, we relished the opportunity to enjoy it with our best boy, Tonka. 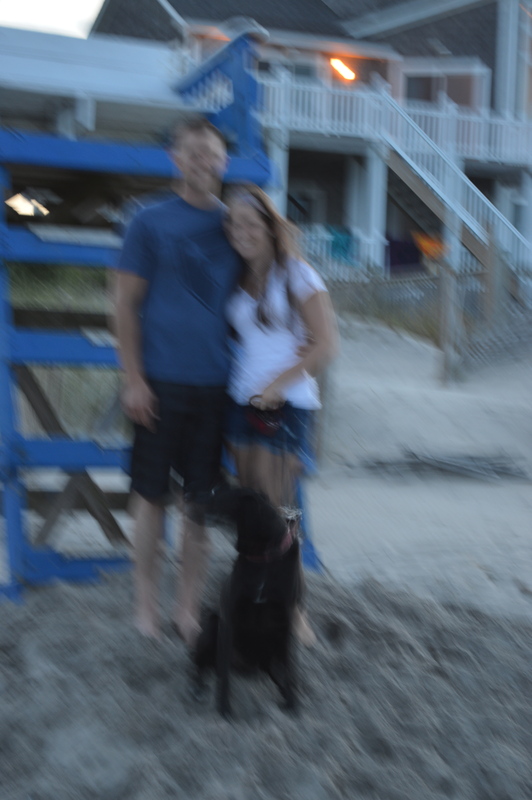 Having our dog on vacation brought an added level of enjoyment to our trip. However, we also saw lots of owners and pups on the beach that maybe hadn’t taken the time to fully think through their plans. 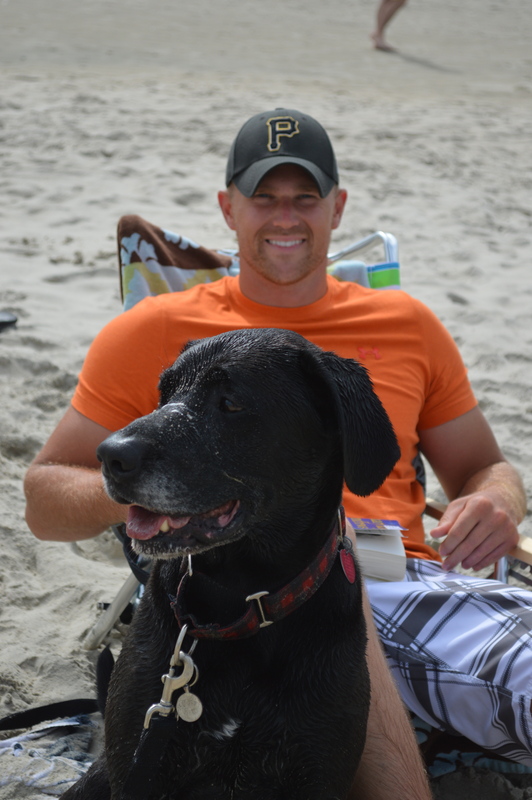 Because of that, we want to share with you our tips for a vacation that is enjoyable for both you, and your pups! 1) Put yourself in their… er, paws. Is your dog a seasoned traveler, or a vehicle vomiter? Is he or she able to be comfortable in new environments, or do they prefer their home and regular routine? Are they a dog that prefers your companionship to all else, or do you have a regular dog sitter or boarding facility that your pup adores? Rather than thinking about what is most enjoyable or convenient for you, take time to consider your dog’s preferences. If he or she is not going to fully enjoy the vacation, then you can bet that it will be more stressful for the rest of the family as well. Tonka is a dog that will never be as content without me as he is when he is in my presence. He loves traveling, but makes it easy on me by sleeping the whole trip. Conversely, Gaige is pretty much the same dog regardless of who is around or where she is, while Georgia feels most comfortable in her home environment. Because of all of that, it was simple for us to decide which dog came along for the ride, and which stayed in the safety of our home. 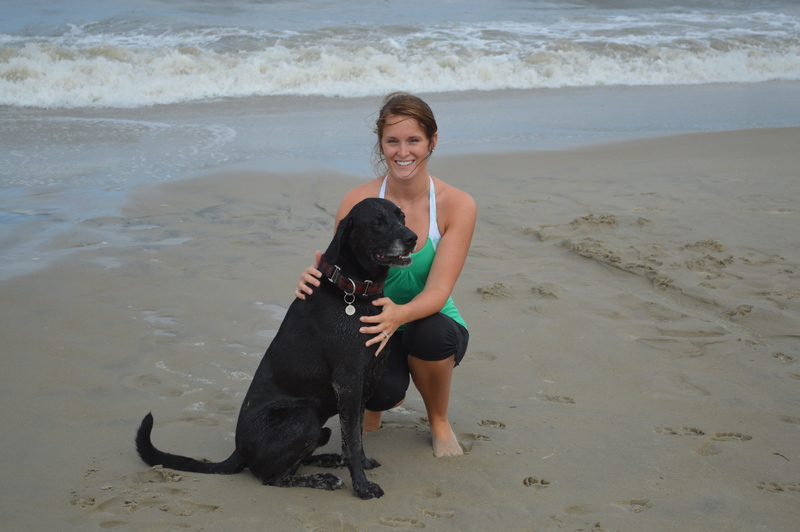 The OBX beaches are notoriously dog-friendly. Many local stores even welcome dogs into their buildings! It is also a fairly easy drive for us, which made it easier on Tonka, as well. If we had been considering a flight, there is no way we would have put any of our dogs through that stress for a short vacation. Furthermore, we were sure to do our homework up front. 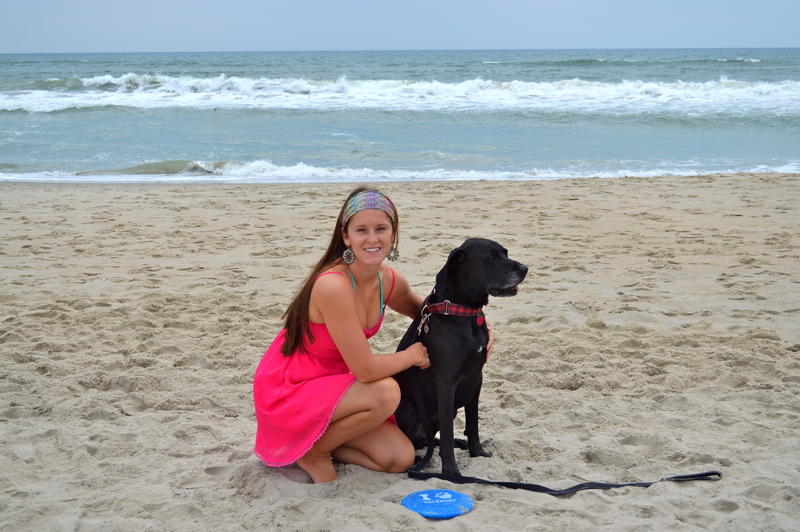 Our beach house rental was dog-friendly, and we researched the local beach and leash-laws as they applied to dogs. We also had the number and location of the local vet on-hand, in case of any emergency. Finally, we were sure to check Tonka’s tags and licenses in order to keep him safe in case of unforeseen circumstances that might separate him from us. 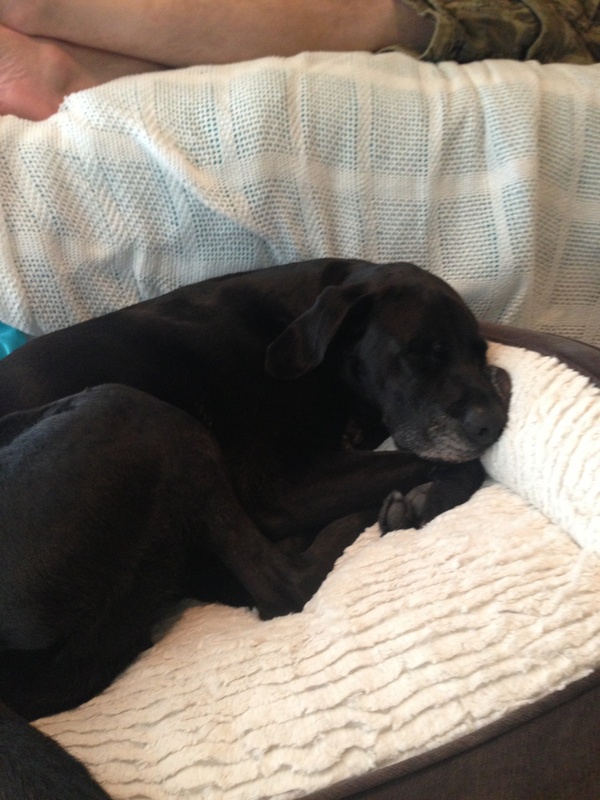 3) How easy is it for you to manage your dog? If your dog is a hand-full at home, expect for their behavior to be dramatized while in a novel environment. Things will be hectic at times, and there will be lots of new sights and smells. If you have difficulty handling your dog at home, chances are that those issues will only be exacerbated on your vacation. You are going away to decompress and relax… if bringing your dog along will only increase your anxiety, then it isn’t worth it for either of you! In that case, he or she will have a much more enjoyable time at home with a friend or at a boarding facility. Tonka will stop on a dime at the sound of my voice, and will never venture more than a few feet from my side, even when off-leash or in hot pursuit of a sandpiper! Because of that, I knew it would be stress-free to have him join us. On the other hand, Gaige is notoriously naughty, and I knew that if we brought her along, some sort of comical troubles would ensue! 4) Be prepared to make new friends! While we were mindful of leash laws and appropriate dog interactions, remember that others, both tourists and locals, may not be so respectful. It is important that your dog be well-socialized in order to justify a trip to the beach, or you may risk an ugly situation. 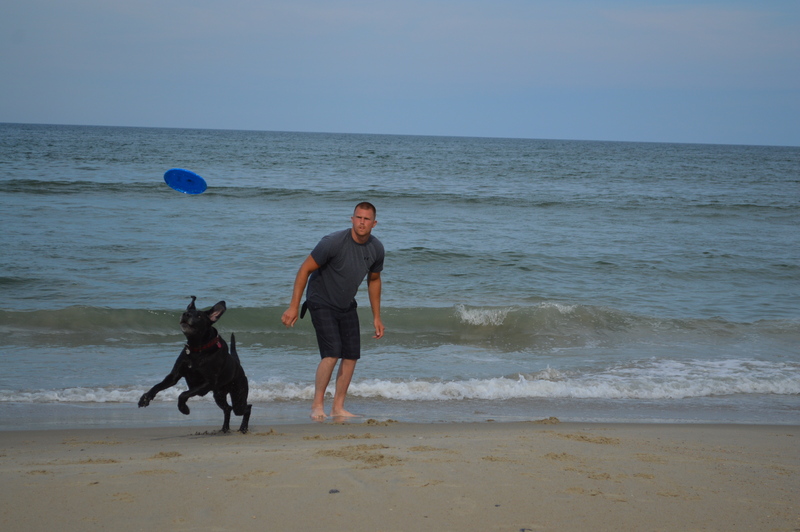 From our experience, the beach during vacation season is probably not the best place for a reactive or defensive dog, only because there are so many elements that are outside of your control. Keeping such a pup in the safety of their own home is probably the best option. 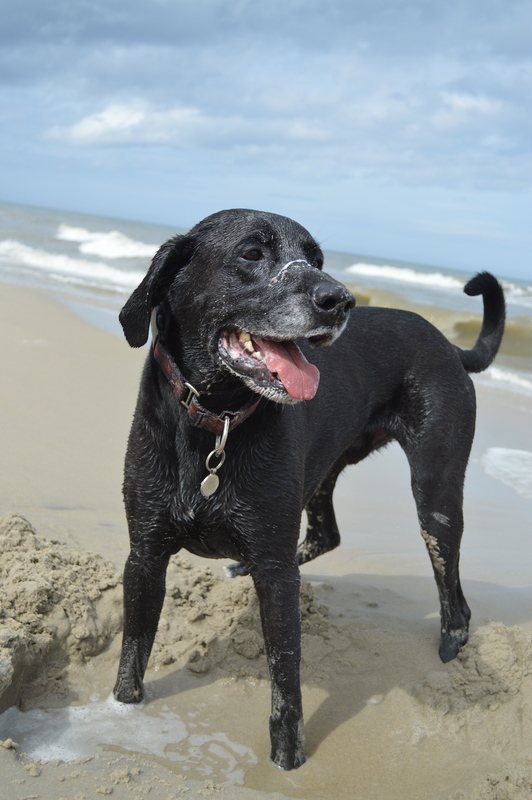 If your dog is friendly with other pups, then he will have a blast at the Outer Banks beaches! 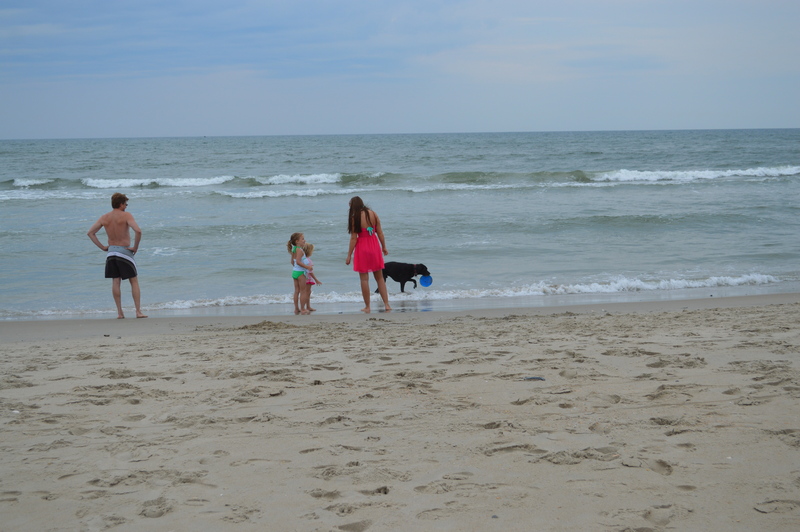 Many of them turn in to rowdy dog parks, with dogs frolicking and chasing each other through the sand and waves. 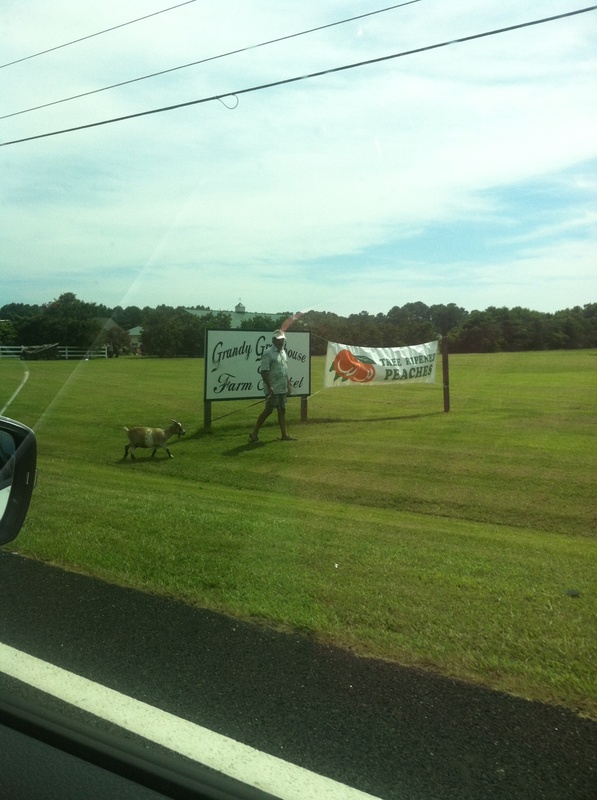 Conversely, be sure to respect local leash laws and other dogs (or humans!) who may not feel comfortable in such an environment by maintaining appropriate control of your dog at all times. That was essentially the theme of our vacation! 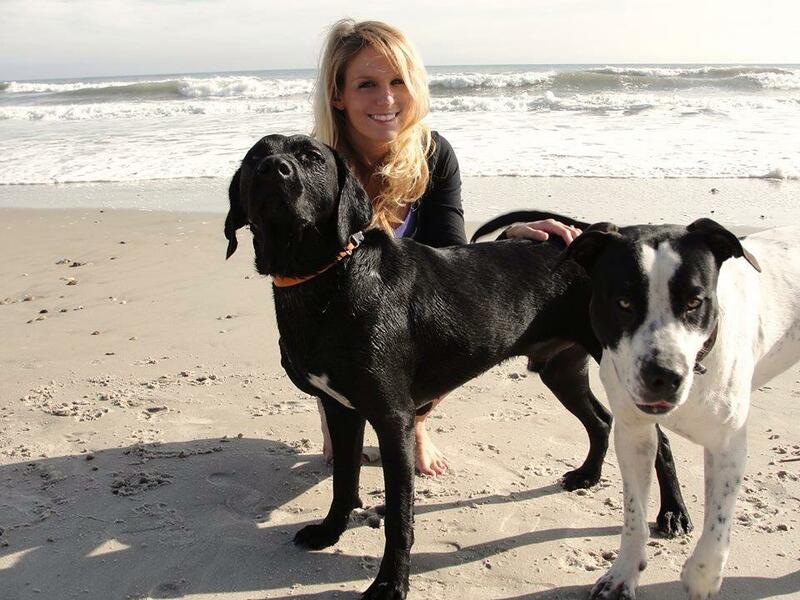 We couldn’t get enough of seeing Tonka revert back to his puppy-like antics on the beach. We enjoyed it so much in fact, that we didn’t really mind having to bathe him after every jaunt out to the water. However, it helped that we packed lots of extra towels, casual clothes, and spare collars and leashes. It was very difficult for me to see owners who drug their dogs out onto the beaches on the hottest days, and didn’t provide them with any shelter or fresh water. You know that sand and black pavement that are too hot for you to step on without shoes? Remember that it is just as painful for your pups. 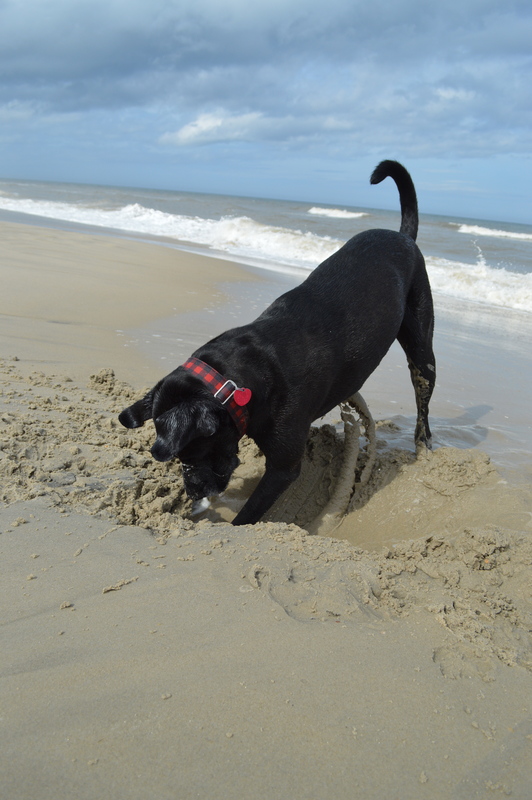 No dog will enjoy the beach during the hottest days, so be sure to have adequate accommodations at your rental to keep him or her safely secured and entertained while you lay out or enjoy the surf. Tonka enjoyed every second of his early morning and evening romps in the water, and snoozed soundly while we were away during the heat of the day. That way, we didn’t have to worry about lugging jugs of water or having burned paw pads. 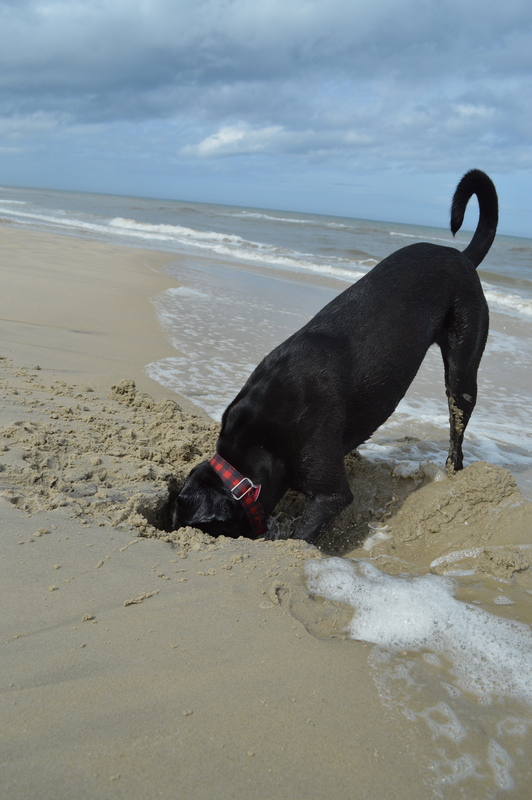 When all else fails… bury your head in the sand!